AnyMP4 iPad Video Converter for Mac is the professional iPad Video Conversion for Mac users, which has the capability to help you convert any video to iPad compatible video formats like MP4, MOV, M4V, etc. Also, you are able to extract audios from any video and convert them to your needed audio formats such as AAC, ALAC, MP3, WAV and more. Besides, it supports the input video formats such as OGM, WTV, Bink Video, DVR-MS, and the audio formats like M4B, AUD, MKA, AIFC, CAF, MPC and QCP. 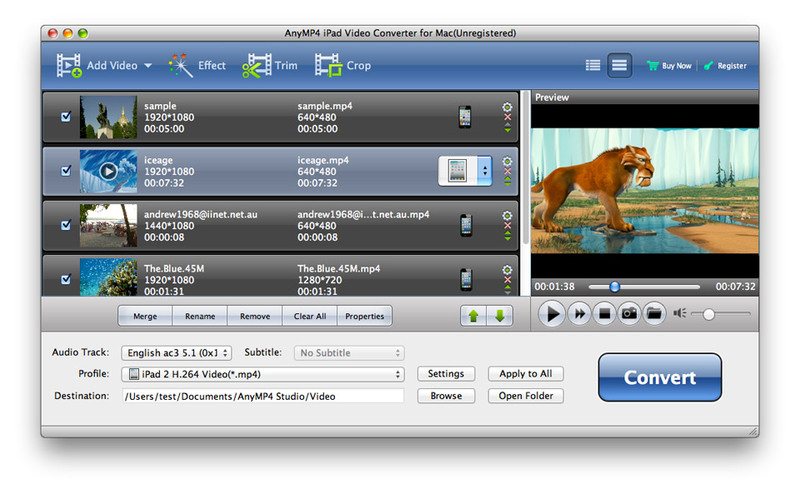 In addition, this AnyMP4 iPad Video Converter for Mac provides you with some powerful editing functions. AnyMP4 iPad Video Converter for Mac can help you convert almost all the video/audio formats such as MTS, M2TS, WMV, MOV, VOB, FLV, ASF, MPEG, MKV and even HD video to iPad supported formats. Also, you can extract audio files from the videos and then convert them to iPad compatible audio formats. Besides, with this software, you are allowed to choose the available audio tracks/subtitles from the video according to your needs. Also, it supports batch conversion. AnyMP4 iPad Video Converter for Mac enables you to trim the video for your needed length by setting the start and end time, crop the video frame, add text or picture watermark to the screen of the video. And you are allowed to merge more than one video file together. Besides, this program is able to help you adjust video effect by setting some parameters like Brightness, Contrast, Saturation and more. AnyMP4 iPad Video Converter for Mac also has the ability to adjust the video settings like Video Encoder, Bitrate, Resolution, Frame Rate, Aspect Ratio and the audio settings such as Audio Encoder, Bitrate, Channels and Sample Rate.